Posted on February 6, 2017	by Blowhard, Esq. Another progressive whiteknight, who appears to know nothing about jazz history, “defends” jazz from white saviors. I loved LA LA LAND and I love even more how it’s driving all the right people crazy. The New Yorker accuses Breitbart journalist Julia Hahn of “writing some of the most aggressive, white nationalist stuff on the site” without bothering to link to a single example. Here’s Hahn’s archive right here. Does any of it strike you as aggressive? If so, what’s the strongest evidence of her white nationalism? Speaking of assertions without evidence, A.O. Scott calls a new documentary about James Baldwin “life-altering” without telling us a single aspect of his life that it supposedly altered. I never tire of the progressive circular firing squad. This might be the most bizarre hobby I’ve ever heard of. 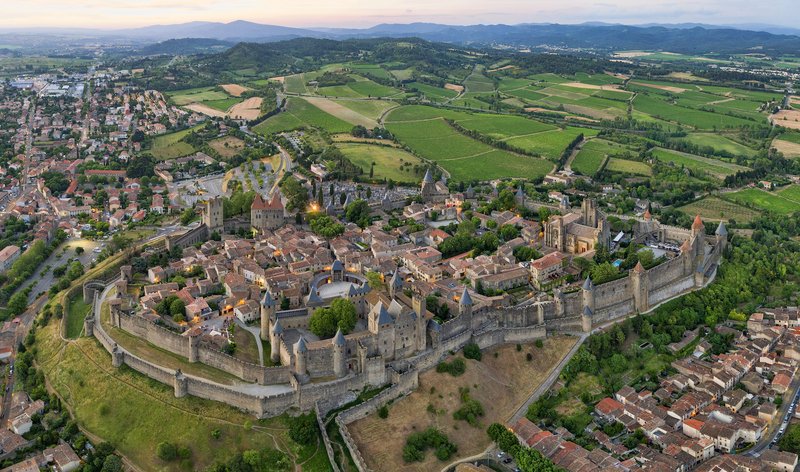 Architecture Du Jour: Carcassonne, France. That sentence is the most inane, nonsensical collection of words I’ve ever read. It’s pretty common, if you like jazz, to revere Parker for his titanic contribution to the music, and he was a purist’s purist, so it makes sense Gosling’s character in the movie was into him. Of course, it’s a bit ironic since Parker was nothing if not progressive, and Gosling’s character is a traditionalist. But maybe that was the point. So tired of this political parsing of every work of entertainment coming out. My wife and I finally got around to seeing La La Land, and I was pretty underwhelmed. It looked great, but the songs were entirely unmemorable and, in Gosling’s case, were delivered with a glaring lack of personality. And I just don’t like Chazell’s depiction of music and musicians. I hated Whiplash because no one onscreen seemed even remotely like actual musicians. Same goes with La La Land. But since it’s a musical, I was willing to let questions of authenticity slide so long as the song and dance numbers were enjoyable. Oh well. Emma Stone is a joy to watch, at least. Yeah, that Charlie Parker line is what set me off too. “Oh, this moron has no idea what he’s talking about.” Either than he was intentionally being deceptive. Whatever the case may be, not sure why I should take such a person’s thoughts on jazz seriously. Your reaction to LLL and WHIPLASH echo what I’ve heard from many (non-insane) detractors. My brother spent many years in the jazz world as a trumpet player and he thought WHIPLASH was “too much.” As for LLL’s songs, I found them very memorable and have listened to the soundtrack a number of times. People seem to be split about 50/50 on that aspect of the movie, but hey, if the songs don’t work for you in a musical it’s understandable that you’ll leave feeling underwhelmed. Maybe now, even their prog allies might begin to recognize just how batshit insane BLM are. Whaddya mean? It’s pretty clear to me. Before seeing the film, Scott felt that blacks were natural moral avatars whose centuries of failure are the result of systemic white racism by bad whites, of which he is not one. After seeing it, Scott felt that blacks were natural moral avatars whose centuries of failure are the result of systemic white racism by bad whites, of which he is not one, A LOT. He’s more convinced that ever of his high moral standing compared to “those” white people. I call that “life-altering” fuh shizzle.